The Madras high court restrained the police from arresting the film's director A R Murugadoss till November 27. The issue over actor Vijay's Tamil film Sarkar blew over on Friday with its producers voluntarily cutting scenes, including an apparent reference to late chief minister J Jayalalithaa and criticism of welfare schemes initiated by her, and the All India Anna Dravida Munnetra Kazhagam government welcoming it. A day after the movie faced a backlash from the AIADMK over the 'objectionable' scenes and reference, prompting the makers to agree for the cuts, Information and Publicity Minister Kadambur C Raju welcomed it and said the 'issue has come to an end' and the AIADMK would not stage any more protests against it. His cabinet colleague R B Udhayakumar thanked the film producers for respecting 'the sentiments of Tamil people' and urged movie-makers to exercise restraint in future. Earlier in the day, Tamil 'Superstar' Rajinikanth threw his weight behind Vijay, questioning the AIADMK's rationale in protesting against a film certified by the censor board. After several ministers objected to the reference to Jayalalithaa and some scenes, including the one showing mixers and grinders being burnt, AIADMK workers on Thursday protested in front of several theatres screening the film, released on Deepavali day on November 6. In a related legal development, the Madras high court on Friday restrained the police from arresting the film's director A R Murugadoss till November 27. Passing interim orders on the anticipatory bail application filed by Murugadoss, who apprehended arrest in connection with some complaints lodged against him, Justice G K Ilanthiraiyan directed him to co-operate with the police and adjourned the matter to November 27. Murugadoss's counsel informed the court that the objectionable portions had already been removed from the film. According to Tamil film industry sources, 'relevant scenes' in Sarkar have been removed and the theatres will now start screening the 'edited' version. They added the cuts in the digital copies of the film for all theatres can be made online from Chennai itself. The cuts effected were 'voluntary' with the approval of the Central Board of Film Certification, they said. "While we don't know how many scenes have been deleted, we can say for sure that the objectionable scene on mixer and grinder being burnt has been removed," they said. Also, the audio part mentioning the name Komalavalli, deemed to be a reference to Jayalalithaa, will be 'muted', they said. Meanwhile, Sun Pictures, producers of the movie, said that certain scenes 'considered to be controversial' were removed in the interest of public safety, as well as on pleas from theatre owners. A company statement said that the ruling party members had resorted to violence and caused damage to property in theatres. "Heeding the requests of theatre owners and considering the safety of the movie going public and their belongings, one or two scenes that were said to be controversial, have been removed," the statement, which also carreid a tag line 'sarkar filmcrew' said. The removal of the scenes prompted Raju to declare that the 'issue has come to an end' and that the AIADMK would not hold anymore protests. "We believe they (Sarkar team) have realised that they have hurt people's sentiments and have come forward to remove the scenes... it is welcome. So the issue has come to an end. The protests (against the film) will not continue," he told reporters in Chennai. Defending the protests, Raju said AIADMK workers 'ranging from an ordinary cadre to the Chief Minister (K Palaniswami)', consider Jayalalithaa as their 'God'. "We have nothing to do with the film or Vijay," Raju said describing the star as a 'dear friend'. He said the party's opposition had nothing to do with criticism of the government. A name said to be referring to Jayalalithaa was used for a negative character and therefore the opposition to it was 'wholehearted' from the party workers, he added. Revenue Minister Udhayakumar thanked the Sarkar crew for removing the scenes. "In future, filmmakers should avoid including scenes that would hurt the sentiments, especially relating to Amma's (Jayalalithaa's) sacrifices and hardwork," he said. Fans of 'dear brother Vijay' also benefited from government welfare schemes like the free mixer-grinder and fan initiative, he told reporters in Madurai. Meanwhile, Rajinikanth 'strongly condemned' the demands for deletion of the scenes. 'It is against the law to hold protests seeking removal of some scenes from a Censor board certified film and trying to stall the screening and damaging the banners,' he tweeted. 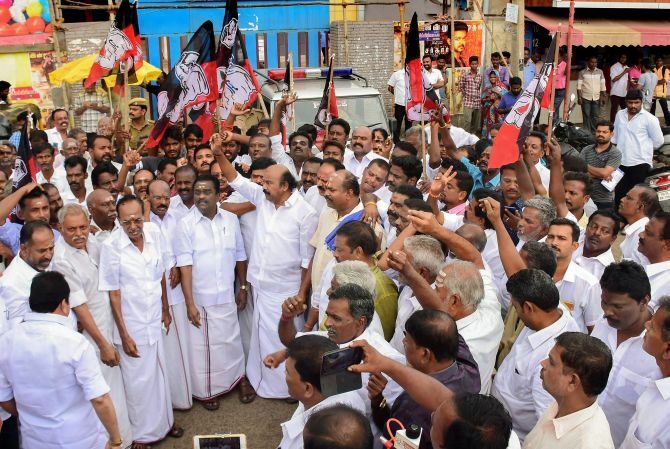 On Thursday, the AIADMK was up in arms against Sarkar with senior state ministers demanding deletion of the contentious scenes, besides threatening to initiate legal action if the film crew failed to comply. The AIADMK took strong exception to scenes showing mixer-grinder and fans being burnt, seen as an obvious affront to its flagship scheme of providing these goods free of cost to people, fulfilling an electoral promise made by Jayalalithaa in 2011. Sarkar had earlier courted a row after an aspiring filmmaker claimed that the film's story was his, following which director Murugadoss went in for a compromise with him. Produced by Sun Pictures, the film stars Vijay and Keerthi Suresh in key roles with Oscar winner A R Rahman scoring the music. Vijay's 2017 film Mersal too had ran into a controversy after the Bharatiya Janata Party objected to some scenes critical of GST among others.